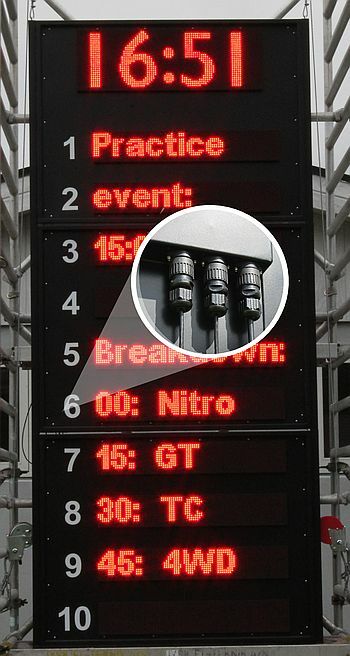 Quick and simple mounting for easy use, are the main thoughts behind the latest generation – Generation 3 (Gen3). 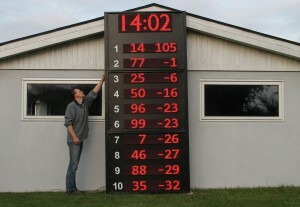 Using the free RaceSignBoard software, you’ll be connecting to RCM Ultimate in no time. The stacked size of Gen3 is 321 cm high and 146 cm wide ~ 127″ high and 58″ wide. Driver lines (1-10) are 16 cm ~ 6″3 high, making it easy to read the sign even at a distance. Stacking a complete Gen3 sign is quick and easy using the RaceSign rods and a few M8 bolts mounted through the tracks on the back side. Section A: showing the backside of a panel with the rods laying beside. Section B: showing the rods inserted into the tubing and the M8 bolts ready to mount. 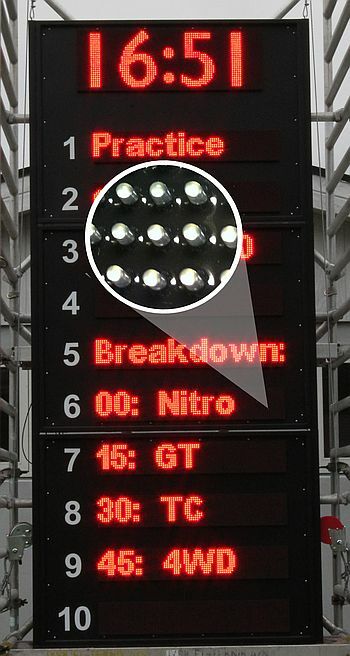 Build-in LED shades makes the sign perfect for outdoor environment. This construction removes false light from an unwanted light source, ex. the neighbor LED, fluorescent tubes or sunlight. Having the signs placed outside in all weather, it’s important that no water enters the sign. 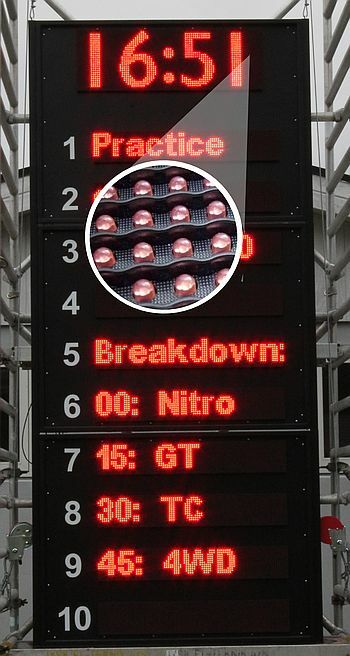 The LED panels have a silicone rubber membrane, blocking any moist or water from entering the electronics. 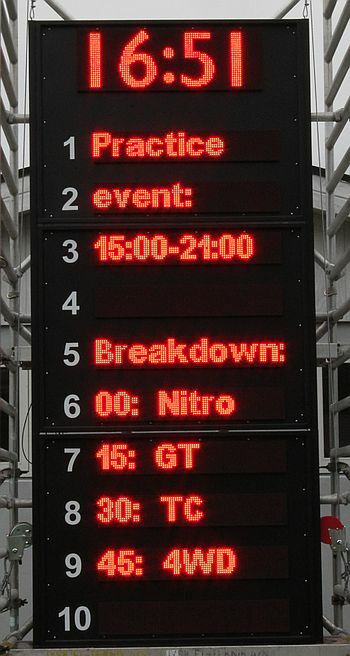 At this width the sign is easy to handle, no matter if you’re stacking the panels, placing them side-by-side or just hanging the panels from a wall. 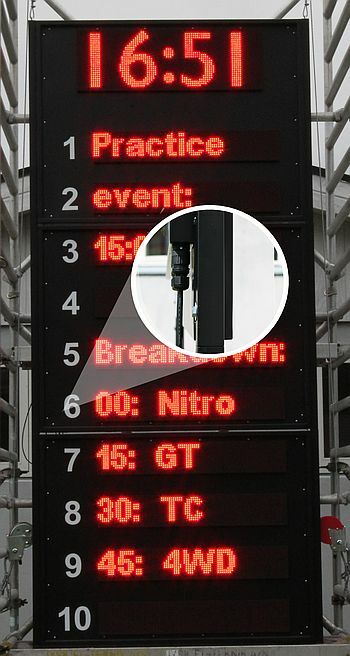 The connectors on all RD Sign’s are designed for IP65 environment. The same 3 connectors are placed on all panels, giving a uniform work process. One connector for the mains and two connectors for the serial communication. When using RS232, only one serial connector is used – but when using RS485, the panels are daisy-chained and therefore need separate connectors for input and output. 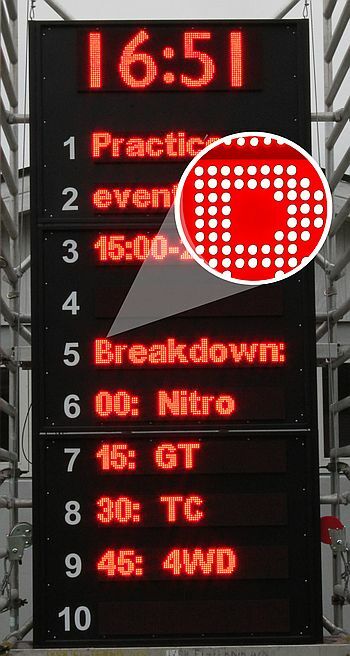 Using LED matrix, there is no limit for what can be displayed. 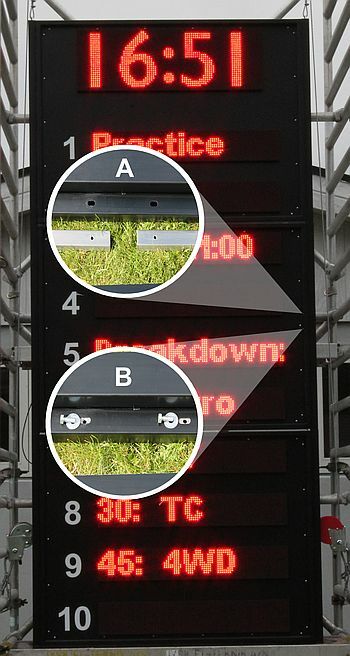 It’s all up to the user/operator of the race track to choose, what he/she wants the crowd to see.